This fascinating and groundbreaking work tells the remarkable story of the relationship between Americans and their trees across the entire span of our nation’s history. The history of trees in America is no less remarkable than the history of the United States itself, from the majestic white pines of New England, which were coveted by the British Crown for use as masts in navy warships, to the orange groves of California, which lured settlers west. In fact, without the country’s vast forests and the hundreds of tree species they contained, there would have been no ships, docks, railroads, stockyards, wagons, barrels, furniture, newspapers, rifles, or firewood. No shingled villages or whaling vessels in New England. No New York City, Miami, or Chicago. No Johnny Appleseed, Paul Bunyan, or Daniel Boone. No Allied planes in World War I, and no suburban sprawl in the middle of the twentieth century. 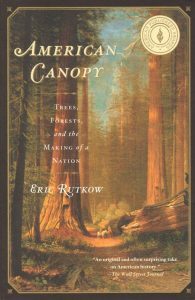 As Eric Rutkow’s brilliant, epic account shows, trees were essential to the early years of the republic and indivisible from the country’s rise as both an empire and a civilization. Never before has anyone treated our country’s trees and forests as the subject of a broad historical study, and the result is an accessible, informative, and thoroughly entertaining read. Audacious in its 400 year scope, authoritative in its detail, and elegant in its execution, this book is perfect for history buffs and nature lovers alike. With the Klondike gold rush, a struggle erupted in Alaska between the protection of big game animals and man`s economic ambitions, a riveting story chronicled by Morgan Sherwood in Big Game in Alaska. 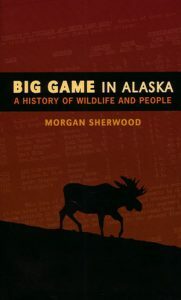 In concise and clear prose, Sherwood charts the history of this environmental and political conflict, examining the creation of the Alaska Game Commission in the early 1930s, the use of distorted science and menacing technologies, the antipathy of farmers and fishermen toward animals, and the prevailing belief in man`s right to shoot wild animals at will. An incisive historical study of the flawed attempts to govern big game predation, Big Game in Alaska will be essential reading for historians and environmentalists alike. The author recounts both the harrowing adventures and the moving experiences that have marked his career as a biologist. 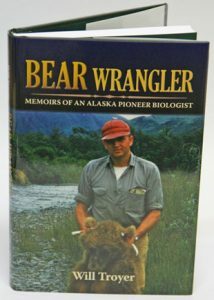 Beginning in 1951, Troyer embarked on a 31 year career at Kodiak Island Brown bear preserve. Also available in paperback [stock id 31348]. Artist/Author: Paulson, Dennis and Les Beletsky. Alaska has both vast wilderness tracts and a modern transportation system, making ecotravelling in the state easy as well as exciting. From the broad expanses of tundra in the Arctic National Wildlife Refuge and the rich seabird colonies of the Bering Sea to the glacier-bedecked snowy mountains and magnificent rainforests of the Southeast, wildlife viewing opportunities abound. 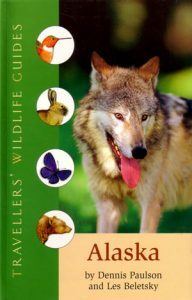 This book contains all the information you need to find, identify, and learn about the region’s magnificent animal life.